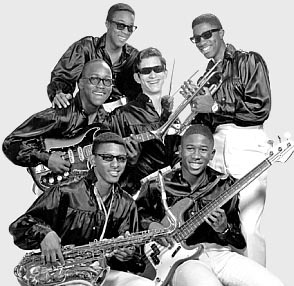 A group of six Memphis musicians called The River Arrows found themselves in the fortunate position of auditioning for and being hired by Stax Records in 1966. The company's goal was to prep them to be a second "house band" for recording sessions at the label's movie theater-turned-studio. 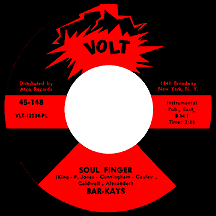 After a name change to The Bar-Kays (taken from a nickname for Bacardi Rum that someone saw on a billboard), the group scored with their debut release, "Soul Finger." The instrumental was an amalgam of several musical influences beginning with the rhythmic line from J.J. Jackson's then-recent hit "But It's Alright" (which they had been performing live in local clubs backing Norman West, future lead singer of Stax act The Soul Children), adding, of all things, the nursery rhyme "Mary Had a Little Lamb" as an opening riff. It started as a casual jam session and came together as a horn-heavy guitar groove. Jim Stewart, co-owner of Stax (with Estelle Axton), present at the impromptu session, went wild over the song but thought it needed a little extra something to make it stand out. Kids were always hanging around in the vicinity of the McLemore Avenue studio, so he had them come in and make sounds like a party was going on and shout 'Soul finger!' whenever he pointed to them (so in essence Jim's pointing finger was the subject of the title). They knew they had a hit on their hands with the finished product; a funk record before it had occurred to anyone to call it that. 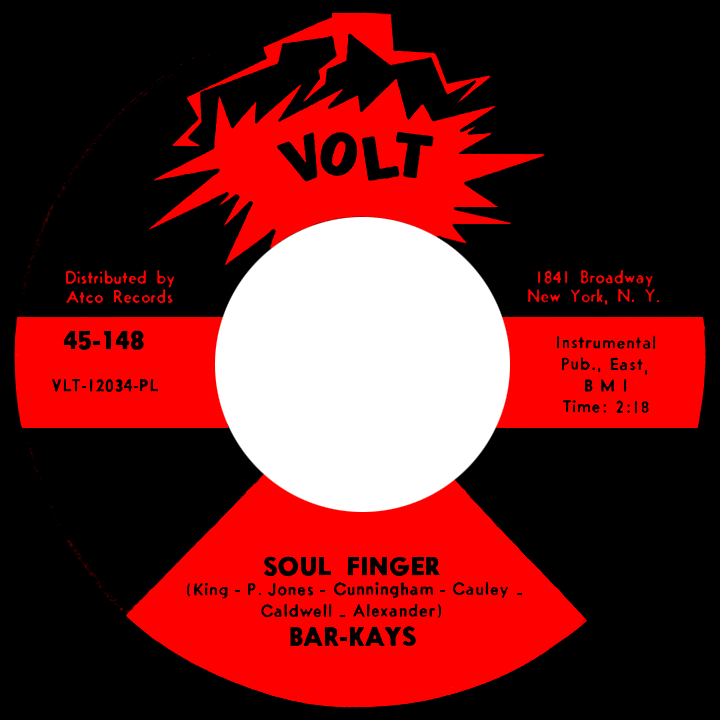 Released on that other great Stax-owned label, Volt, it was a hot track in the summer of 1967, hitting top 20 pop and top ten R&B. The band's original 1966 lineup featured guitarist Jimmy King, bassist James Alexander, Ronnie Caldwell on keyboards, Ben Cauley on trumpet, Phalon Jones on sax and drummer Carl Cunningham. House band The Mar-Keys (of "Last Night" fame), with some varying members and contributions from Booker T. and the MG's, had been stretched thin over the five or six years since the company was founded. The Bar-Kays quickly rose to their potential through the efforts of MG's drummer Al Jackson, who helped to mold them into a tighter, more prolific version of themselves with more than a hint of Mar-Keys style mixed in. In 1967, they were used on a number of hit singles by Sam and Dave and Otis Redding and lesser-known efforts by other Stax-Volt artists, with outstanding results. Besides all the session work, other Bar-Kays tunes made a mark in 1967: the bluesy, harmonica-heavy "Knucklehead" on the flip side of "Soul Finger" received its share of airplay on R&B and some pop stations, and follow-up 45 "Give Everybody Some" gave off an urgent party vibe with all components poppin', notably a hot organ solo by Caldwell reminiscent of prime Booker T. Otis Redding was so impressed by the sextet and its seemingly effortless musicianship that he hired them to be his backing band on tour, traveling on his private Beechcraft plane, starting with an engagement at New York's hottest Harlem venue, the Apollo Theater, for ten nights during the summer. With session work in between, the Redding tour continued in the fall. On the afternoon of December 10, 1967, en route to a scheduled appearance in Madison, Wisconsin, the plane went down in Lake Monona, just east of the city. Ben Cauley was the sole survivor of the crash. A rescue team arrived quickly; had they been there a few minutes later, even he might not have made it. Four members of the Bar-Kays, along with Redding, the pilot and an assistant died that day. James Alexander hadn't been traveling with the band for this particular part of the tour; suddenly he and Cauley were the only ones left. The incident stunned everyone in the Stax/Volt family as well as many millions of Otis Redding fans who have kept the dynamic singer's memory alive. It could have spelled the end for the Bar-Kays and for Ben Cauley's career. The horrifying experience nearly caused him to call it quits, but after several months he and Alexander decided to reform the band (though Cauley ultimately decided a few years later to leave and focus on family life while doing occasional session work). Some of the early musicians to join the new band included guitarist Michael Toles, organist Ronnie Gordon, sax player Harvey Henderson, drummer Roy Cunningham and, when the need for a vocalist came into play, Larry Dodson (a former member of The Temprees). This core unit, in addition to James Brown and The Meters, paved the way for the '70s funk movement; backing Isaac Hayes on his highly-regarded 1969 album Hot Buttered Soul served as an ideal warm-up. In early '72 the new band hit the singles charts for the first time in four years with "Son of Shaft," an extension of Hayes' chart-topping theme from the first film installment of Shaft. After Stax fell into financial difficulties, forcing its closure and sale in the mid-'70s, The Bar-Kays signed with Mercury and began rolling out a nonstop bombardment of R&B smashes (and occasional pop hits) starting with "Shake Your Rump to the Funk" in 1976. Some of the band's hottest grooves include "Too Hot to Stop" in '77, "Move Your Boogie Body" in '79 and "Freakshow on the Dance Floor" in '84. All told, two dozen records hit the charts between 1976 and '88, a body of work that put them, along with George Clinton's Parliament and Funkadelic dynasty, in a funky class above the rest.